The award-winning comedian, talk show host, podcast producer, globe-trotter, guitar aficionado and lover of burritos is no stranger to packing a suitcase, and is headed back down under (after visiting in 2000 for the Sydney Olympics) to perform one show only! 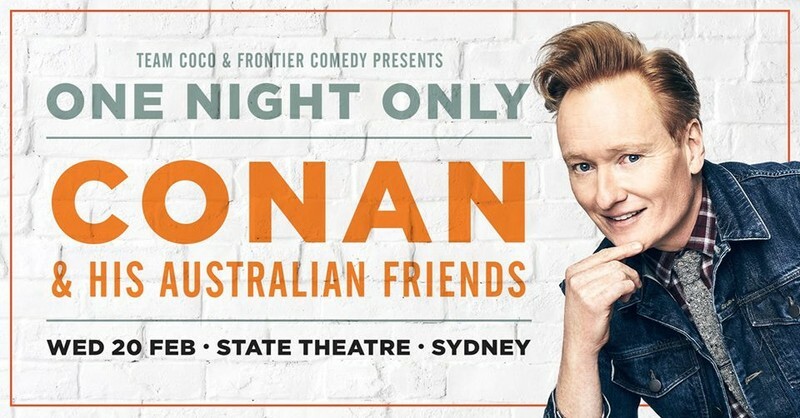 Conan O'Brien, the USA's longest tenured late night television host, will return to Australia to make his live stand-up debut next month, with an exclusive show at the State Theatre in Sydney. With millions of TV viewers worldwide, Conan O'Brien's online audience is just as impressive: 28 million+ on Twitter, five million on Facebook, over two billion on YouTube. There's his hilarious travel series, currently showing on Netflix: 'Conan: Without Borders'. January sees the anticipated return of his hit late night TV show 'Conan', back four days a week with a new 30-min format. "My three-month absence can only mean one thing—radical cosmetic surgery," O’Brien says of show’s revamp. "Tune in for a true freak show!" At the end of 2018, there were other new developments: O'Brien toured USA/Canada on an 18-date live tour—his first stand-up in over eight years. He also launched the excellent new podcast 'Conan O’Brien Needs A Friend', which sees some of the biggest names in entertainment, music, comedy, literature sit down each week. Guests so far have included Adam Sandler, Will Ferrell, Kristen Bell, Marc Maron, Nick Offerman & Megan Mullaly. Then there’s the small matter of a massive online archive, due to launch later this month, which will see clips of all Conan’s TV work housed in one big website, teamcoco.com. Don’t sleep on your chance to witness Conan O'Brien's unmistakable talent when he hits Sydney next month. Act quickly to secure your tickets!